We've only made it to the beach once, but we've been busy crossing errands off the list. Since my internet time is so limited, I used my Frugal Hacks spot to chat about what I've been whipping up in my mother-in-law's kitchen. Did you know a package of 4 ice cream sandwiches costs $7.85 here? I'm thinking it's almost worth it! On the other hand, it's making this frozen lime dessert seem awfully frugal by comparison. That desert looks delicious. Hope you are having a good time and have a safe trip home. Actually, I just paid $6.09 for 6 organic small ice-cream sandwiches at Kroger's, so your island price doesn't sound so bad. Besides, you are on vacation, so relax and eat all the ice-cream you want! Sometimes, price shouldn't be the deciding factor, IMO. Green and white are such crisp cool colors and the food looks very comforting. Glad you are ok . Take care in the heat , relax and celebrate. Oh, my goodness! Don't do too much and stay cool! The dessert looks delicious. I was amazed at the ice cream section in Costco last night - everything has gone up about $2 more an item! Hope you're having a wonderful time Meredith! 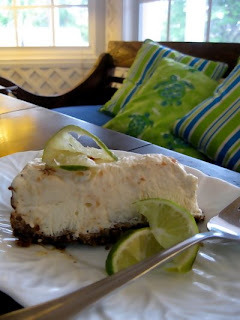 Any lime dessert is a hit with me! That one sure looks good! I just bought limes for limeade, maybe I should rethink that! Stay cool if you can. The dessert looks absolutely delicious. Yummy.